It has been a while since our last blog post and many things have changed in these last months. Whilst we have been quiet, it is only because we have been so busy. We'll be getting noisier again from now on as Bandwagon is now entering the regulator approval and product sales phase. Modern Wagering Systems' relationship with Typhoon Gaming has come to a positive end following Typhoon Gaming's decision to leave the market following an asset sale. As such, our pages promoting the Typhoon totalisator and some of the older, Typhoon-centric posts have been removed. We wish them well. We have also secured some private outside investment which has allowed us to expand our full-time development team beyond just the founder. We are continuing to seek investment and will be issuing an Information Memorandum to those sophisticated investors that we have had prior relationships with. We have also developed some new products with a joint venture with another long-standing member of the Australian wagering scene. These products are in client testing phase now and will be entering full production over the coming months. We're really excited about getting into production! An important milestone for any fledgeling software company. BANDWAGON development is still powering along. We're feature complete and just now going back and sanding off a few of the rougher edges before publishing our API, finalising our regulator approval and beginning our sales drive in earnest. So, as they say in the classics, watch this space. Software written by real engineers after The Empire Strikes Back was released who know how to build great software (and that Darth Vader was Luke's father). Modern Wagering Systems is proud to announce that the development phase of our sportsbook system has reached an important milestone - online pre-release. It's still early days yet, however Bandwagon is at a stage where the end product is now very clear and definite details of operation can be released to the market. Enhancements and development will continue over the coming months as we sign clients and fine tune our functions and capabilities. As we continue to make our way out of the lab, I will be starting to demonstrate Bandwagon in person. Bandwagon, as a start up product new to market, is looking for its first customers, trial beta sites and potential investors in Modern Wagering Systems. People looking to fill one or more of these roles are very welcome to get in touch for a prospectus. The rest of this post descends into the technical, but finishes off with a demo for those less interested in the nitty gritty. not tied to any specific technical ideology. Horizontal scalability, from a technical standpoint, means that multiple instances of Bandwagon can run on multiple servers, serving multiple clients backed by multiple databases with no single point of failure and no data joins across servers. In fact, the data model itself has no relational joins in it. So every database table could be in separate databases on separate machines without needing to make changes beyond configuration. This allows for decent horizontal growth while still being able to put the entire system on a single machine suitable for a one person company as well. Being able to scale down and up is important to us. Avoiding any particular technical ideology for Modern Wagering Systems is about being flexible and not nailing our colours to any mast of a particular vendor for a database or an operating system. Bandwagon can run on a number of operating systems, in different configurations and backed by different databases. Sure we have our preferences and recommendations, but by building Bandwagon as a RESTful API you can simply host it, pick from a number of major databases and then choose whatever technology you like to interact with it. We provide example sales channels which can be used straight away but there is nothing stopping a client from building something completely new and different. Our front end and admin uses the same API that your front ends and admin can. No lock in and freedom to move and grow as you need to quickly without having to migrate systems. So, speaking of example sales channels, below is a link to an example desktop web application to take bets. It is running a feed from Tattersalls to create markets and prices which updates every 30 minutes. It is hosted on a cheap virtual server, backed by a MySQL database and running NginX for a web server. Everything is on the one machine and even on this literally $10 a month configuration it is capable of several hundred bets per second. OK, here's the link: sydney.modernwageringsystems.com and apologies if you're using Internet Explorer. Right now this demo isn't supported on IE but it will be soon. Firefox and Chrome work fine for this demo. I'll be following up with more posts and details as we continue to develop Bandwagon. I'm especially interested in running bandwagon on some different databases and seeing how the performance compares and publishing results. I have taken a couple of weeks off from chipping away at BANDWAGON which has given me some time to catch up with the usual events over Christmas. One thing of interest, and relevance to wagering, was a recent visit from my father with a few of my Grandfather's old notebooks. My Grandfather was an SP bookmaker back in the day, which grew from a "hobby" to a small cottage industry from at least the 1960s through to the early 1980s. He was based in Sans Souci and ran books at several local bars including the St George Motorboat Club, Ramsgate Hotel, Ramsgate RSL, The Taren Point Hotel and a few others. The old boy's turf stretched through the majority of the greater Kogarah area with the blessing of the local constabulary. Said blessing was maintained regularly via offerings within brown envelopes and cardboard cartons - so I am told. At its height, operations were conducted through a private flat in Bondi Junction and a staff of three taking bets by phone out of the back of the family home. So much so that my father was instructed not to call my mother (it was her dad) on either Wednesday or Saturday to keep the lines open for bets. Each Thursday he would make his way to the Tattersalls Club to settle his books. Then, the following Monday, my Grandmother would totter down to the local bank to disperse funds in 15 separate bankbooks in 15 separate names. She was, and still is at 95, a very stern and proper woman. It's always hard to imagine her nicking down to the bank to do a little light money laundering. It was certainly a different time. Returning to the present, what my father arrived with is what I gather was an SP bookmaker's pamphlet outlining the rules and limits which would be given to a punter to make the game clear. Here it is below. Note the blacked out initials! A little scratching revealed the initials. Not my Grandfather's initials so he must have pinched it from a competitor. Does anyone know who J.W.R may have been? From a misdemeanour hobby through to the indictable offence that was the small business it grew into, he maintained that he paid taxes and "always made his money honestly" and that's why he never came afoul of the law. This may well be true but another piece of memorabilia (below) may shed some light on his good fortune. As an SP bookie, having a senior minister and eventual deputy leader of the Australian Labor Party as your old boxing chum is certainly good for business. He had quite a few friends like these. 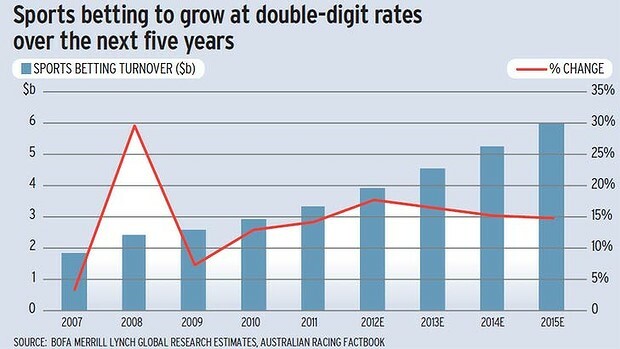 Here's to 2013 and the (legal) wagering industry. Best luck to us all. The best scan I can manage since it's framed. The inscription reads "To Ken, My pal & a grand guy From Tommy 26/10/41"
This is the first post in what is to be an adventurous and very busy six months. Modern Gaming Systems is a new company that I have formed after no longer being an employee of Typhoon Gaming. We still remain close, I am marketing Typhoon after all, however I am independent and looking to find new clients and opportunities in the global wagering business. From Al Swearengen in the late, great Deadwood came the saying "Announcing your plans is a good way to hear God laugh", however in startup businesses it can be an effective marketing tool when secrecy would only serve itself. So I guess what I'm saying is that when it comes to new firms I'm much closer to the Jason Freedman way of thinking rather than the Steve Jobs school of thought. I want to use this blog to build an audience over the coming months to show how our products and services evolve and how people interact with us. And to do that as a company, well, you're going to have to give stealth mode a miss. Plus, I'm really excited about all of this and want to share the news as it emerges. Keeping potential clients and investors ignorant of your plans doesn't seem much of a business plan to me. So my intentions here over the next six months are primarily to get BANDWAGON up and out of the lab as well as promoting Typhoon as a vehicle for new Parimutuel bet types. I believe that both of these goals represent clear gaps in the global wagering market. For example, apart from ATG's V bets over the last 15 years or so there has been (arguably) little innovation in terms of getting genuinely new bet types out into the market. And secondly, since WAGERplayer left the market, there just isn't a decent middleweight sportsbook platform available anymore. There's a small one and a big one but one hell of a jump in between them. So that's pretty much the plan. Though I am keeping a few surprises up my sleeve to keep everyone on their toes. Interested in hearing more? Drop me a line.